A little bit stronger every day. I’m reporting another no-new-thread month at Living Small! (You can pat me on the back if you want.) I’ve been dangerously close to walking to the thrift store over the past two weekends, but other interests (and a lack of cashflow) have kept me on the wagon. I did, however, knit a hat. Well, a beret. Well, more like a blue sack that makes me look like a plum, in the words of the Living Small Man. See below; it is as yet stitched together (note the orange-y stitch markers). Given the Blueberry Muffin look of this chapeau, I may be frogging the whole thing. Robert and Deborah Luther fit themselves, as well as a large dog and a cat, into 396 square feet on the main floor; there’s another 156 in the not-quite-finished upstairs. Certainly, cutting ties with prized possessions isn’t always an offshoot of living small; instead, for many — Living Smaller included! — that definition of “prized possession” takes on a different meaning. Rather than furnishing a sense of wholeness and fulfillment, those piles of prizes, when crammed into a small space, turn a bit ugly. At Living Small, this ugly-turn signals that it’s time to pare down, to reevaluate the purpose of each inanimate resident taking up space in our less-than-spacious residence. Considering that, I wonder: What’s the psychological shelf life of that tube of circa-’68 Mary Quant eyeshadow creme I nabbed from the back of my mom’s makeup drawer ten years ago? Via the Pasadena Weekly comes a story of the Dervaes family, a foursome of folks who’ve turned their 1/5-acre lot alongside the Foothill Freeway in Pasadena, Calif., into a green (and Green) oasis, complete with a vegetable and fruit garden, a solar powered outdoor oven, and a biodiesel-guzzling ’88 Chevy Suburban. According to Weekly reporter April Caires, the metrofarm grows approximately 6,000 pounds of produce per year — more than enough to sustain patriarch Jules Dervaes and his three adult children, all of whom help run the little farm in the city. The remainder of the produce is sold to nearby restaurants, netting the family’s $25K/year income. Son Justin distills biofuel for the family SUV. Daughter Jordanne runs the family website, Path to Freedom, which has been sharing the Dervaes message with the world since 2001. What to see the family in action? Check out the NY Times Mag‘s five-minute vid. So. Is it reasonable to think that all of us could do this? Live Small, sustainably? Certainly, there isn’t enough arable land to go around; even at 20 percent of an acre per family, we’d quickly run out of space. Of course, if it’s possible to produce three tons of fruits and veggies on each tiny-farm tract, there could be enough food to go around. Right? Granted, loads of U.S. cultural givens get in the way of this Thoreau-ean method: lawns, for one thing. Meat lobbies, for another. Climate, for yet another. Economy, wealth obsession, disconnection from food, the high price of leisure. But how many potatoes could I grow in front of my house? How many strawberries? How much spinach? Instead, there is lamb’s ear. A climbing rose. A blighty tree and boxwoods. Truly: How could I farm out here, at the heart of Seattle? Around my tiny house? Hello! Super cool, right? French doors AND a transom? While this space is a mite bigger than my own (their 624 sq. ft. would eat my 509 in a New York minute), I do admire the way the pair has separated living and lounging areas, but nevertheless achieved a complementary style vibe. Color. Love. It. Must. Have. Kitchen. Green. Oh my! For more photos of the place — and to cast your vote (super cool!) — visit J & E’s spot at AT. Washingtonians are mad for farmers markets, according to the Seattle P-I‘s Debera Carlton Harrell. 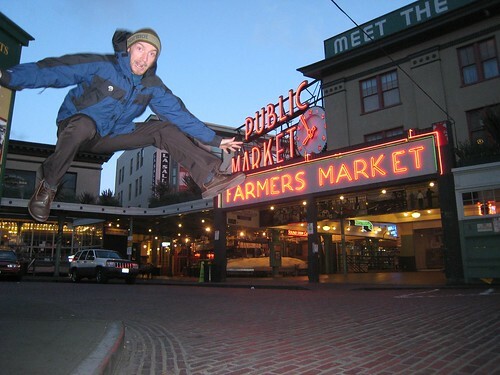 Attendance at Seattle’s 13 neighborhood markets — including the ultra-famous Pike Place Market — has skyrocketed in the last year, reports the Seattle-based Neighborhood Farmers Market Alliance. The year-round Ballard Sunday market and University District Saturday market have reported record numbers, says Carlton Harrell: the Ballard market clocked more than 5,600 shoppers on a recent Sunday, compared to 3,000 the year before; the U District market saw $2.2 million in vendor profits last year. I’m guessing all this talk of carbon footprints and organics and locavorism is the culprit behind this farmers market explosion. And not a moment too soon, say I. Why wouldn’t we want to support our local farmers? Why wouldn’t we want to eat fresher-than-fresh produce that hasn’t been carted thousands of miles? Doesn’t this make sense? Am I bonkers? Of course, finding leisure time to browse ‘n’ buy at a farmers market can be a barrier to some. Perhaps the push to make more markets available in more areas can help curb the time crunch. Want to find a farmstand near you? Seattleites can check out the Neighborhood Farmers Market Alliance. For markets in the Puget Sound area, try Puget Sound Fresh. Beyond that? Visit the Washington State Farmers Market Association. Photo: My pal Justin, December 2006. I hope he doesn’t mind.